So last week I posted about the Purple Quilt for a friend going through something horrible, and I also mentioned that she asked me to bake her something. So I made these dark chocolate cupcakes, which are from the same recipe as the Pac Man cupcakes. And I also made vanilla buttercream, from a different recipe than my usual vanilla frosting. My favorite thing about this batch of cupcakes (aside from the purple frosting, just add food coloring) is that I didn’t realize I had no sour cream until the minute I needed to add it to the batter. Which should have been a baking crisis, BUT I happened to have some Greek yogurt left over from another recipe I made last week. So I just threw that in instead, same quantity, and…I may be making these with Greek yogurt from now on. It just gave them the slightest little tang that was really yummy and hard to put your finger on. So maybe that will be my new secret ingredient (Shhh…don’t spill the beans). Adjust oven racks to the upper middle and lower middle positions and heat the oven to 350 degrees F. Line muffin tins with cupcake liners. Melt the butter, cocoa powder, and chocolate together in the microwave, stirring often, for 1-3 minutes (until fully melted and smooth). In a medium bowl, whisk the flour, baking powder, baking soda, and salt together. In a large bowl (or stand mixer, which I used), whisk the eggs and vanilla together until uniform. 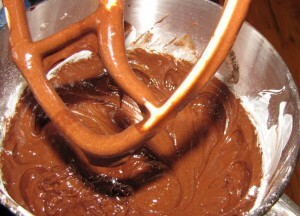 Slowly whisk in the cooled chocolate mixture until combined. Sift about a third of the flour mixture over the batter and whisk in. Whisk in the sour cream (yogurt). 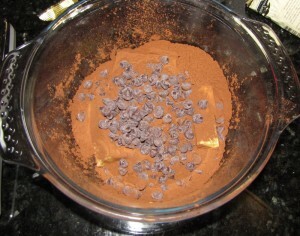 Sift the remaining flour mixture over the batter and mix until completely incorporated (the batter will be thick). Use a greased 1/4-cup measure (or an ice cream scoop) to scoop the batter into each cupcake cup. Bake the cupcakes on the upper middle and lower middle racks of the oven 15-20 minutes, until a toothpick comes out with a few crumbs attached. Rotate cupcake pans halfway through baking (I did the full 20 minutes, 10 minute rotations, and they were perfect). Let the cupcakes cool in the tins for 10 minutes, then transfer them to a wire rack to cool completely. Then frost them. 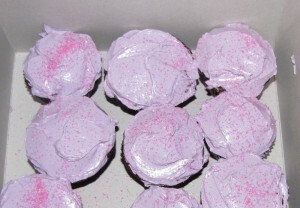 **I made the cupcakes the night before, put them in airtight tupperware, then frosted them the next morning. Worked great. Whip the egg yolks in a large bowl with an electric mixer on medium speed until slightly thickened and pale yellow, 4-6 minutes. Meanwhile, bring the sugar and corn syrup to a boil in a small saucepan over medium heat, stirring occasionally to dissolve the sugar, about 3 minutes. Without letting the hot sugar mixture cool down, turn the mixer to low and slowly pour the hot syrup into the whipped egg mixture without hitting the side of the bowl or the beaters (this was tricky, some of it hardened on my mixer bowl and hook no matter what I tried). 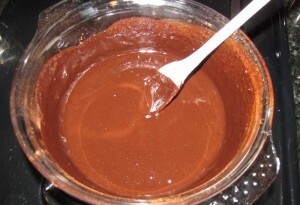 Increase the mixer speed to medium-high and whip the mixture until it’s light and fluffy and the bowl is no longer warm, 5-10 minutes. 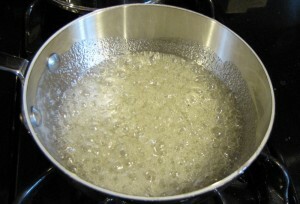 Reduce the speed to medium-low and add the vanilla and salt. Gradually add the butter, one piece at a time, until completely incorporated, about 2 minutes. 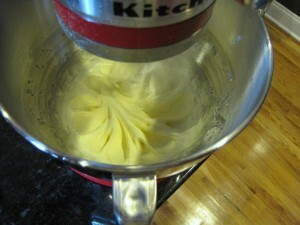 Increase the mixer speed to medium-high and whip the buttercream until smooth and silky, about 2 minutes. Color if you’d like with food coloring.